Plus-size model? Most of the world doesn’t seem to think so. I was reviewing my email when this article from Digiday entitled “For brands, marketing ‘plus-size’ is a tricky line to walk” showed up. The article talked about the recent uproar about Calvin Klein model Myla Dalbesio’s interview in Elle Magazine where she referred to herself as a ‘Plus Sized Model’. Social media outlets erupted in anger as many people rightly pointed out that as a very tall woman who is size 10 at most, she is considerably thinner than the average American woman. And while she might qualify as “plus-sized” in modeling terminology (which can apply to any woman over size 6 according to the article in Elle) she certainly doesn’t qualify as plus-sized in the way that most of us understand it. To be fair, I think it’s important to note that Calvin Klein did not label her as plus-sized. It simply put her in a group of models of varying sizes to promote their new Perfectly Fit line of underwear. Myla described herself as plus-sized. But this pesky question of labeling has come up since the early days of the “husky” department and most retailers still don’t seem to get it right. 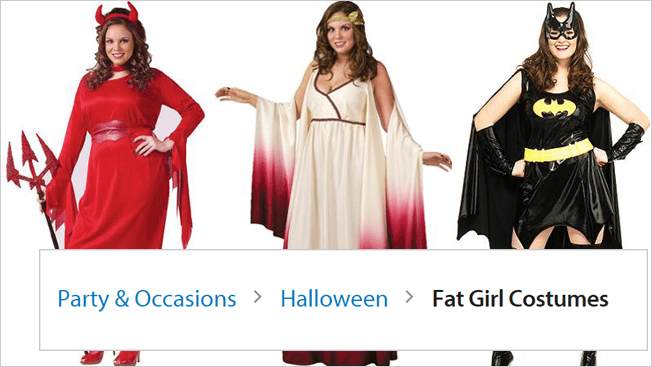 We had the kerfluffle earlier this year when some online catalog pages identified Wal-mart Halloween Costumes “Fat Girl Costumes”. Many people took exception to this labeling as extremely rude, while at the same time, many people in the Fat Acceptance community who identify themselves with the word “Fat” thought it was just fine. As a woman who calls herself “The Fat Chick” I wasn’t offended. But many people were. Walmart’s Halloween section before the site got changed and the company apologized. Add to this, Dillard’s debacle which Ragen Chastain blogged about today and you have to wonder, who the hell is doing this marketing stuff anyways? Who at Dillard’s thought it would be okay to put a sign that says “Dear Santa, This year give me a fat bank account and a slim body. Please don’t mix them up like you did last year.” Do they do any market research? Do they understand how this will be perceived in the marketplace? Or do they see it as clickbait with the idea that all attention is good attention as long as they get the URL right? And then we have Old Navy, catching online flak for making their plus-sized clothing more expensive than the exact same garment in a smaller size. There is now a national petition circulating on Change.org asking Old Navy to unify pricing for women’s clothing of all sizes. 2. Have more than a few token items in a variety of sizes. The sad truth is that larger sizes are often relegated to their own department because such a small percentage of the store’s stock comes in any thing over a size 12. Larger people get really tired of flipping through cute and gorgeous things that don’t come in their size. If most things on the rack had a size 14 through a size 30 or 32 or 40 on them, we wouldn’t need to go to the “plus-sized” department or the “women’s department” we would go to the clothes department. The special sizes departments are just to keep us from hanging ourselves with a pair of stripy tights because we’ve looked at 85 fabulous things that only come in a size 4. You don’t charge more for a size 10 than a size 0. So there is no reason to charge more for a size 16 than a size 10. Just average the prices down the line and charge accordingly. See? That was easy! Treat your customers of all sizes, just the way you would like to be treated. Do you want to see a sign suggesting that Santa bring you better judgement, more kindness and some freaking common sense? No? Then don’t put out a sign suggesting that Santa bring your women customers or your young girl customers a new body. There! Done! I think everybody should be able to approach the holidays in some fabulous clothing that makes them feel comfortable and happy. So retailers, listen up! There are lots of people who aren’t size 4 or even 14 and have lots of money. So if you really want to start the day after Thanksgiving “in the black”, get it together. I think that is something for which we could all feel truly grateful. P.S. 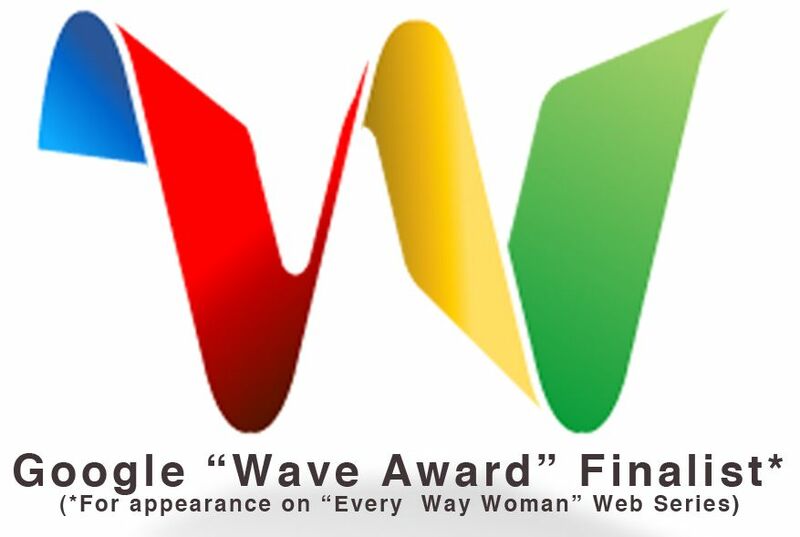 Want me to come talk to your organization about “plus-sized” clothing and fashion for folks of all sizes? Click HERE to see some video, learn about my speeches and book me! P.S.S. Want to connect in and get free stuff? Join my mailing list HERE. This entry was posted in Uncategorized and tagged Big fat bank, Calvin Klein, change petition, Dear Santa, digiday, Dillard's, Elle Magazine, extended size, fashion, fat girl costumes, fatshion, Halloween, inclusive, Myla Dalbesio, offensive, Old Navy, plus-sized, Ragen Chastain, retail, slim body, Walmart, women's department on November 12, 2014 by fatchicksings. Its not going to change because thin women don’t like seeing the larger sizes in the same racks that they shop in. I appreciate target for at least going up to size 18 in most of their clothes. I buy most of my clothes there though I could afford higher prices. It’s frustrating that even vendors who “cater” to larger sizes (and I use the term “cater” loosely) will charge a higher price for a larger size. I think your idea is a great one – average out the costs and charge one price no matter what the size. Period. It’s really not that difficult.